Starting out in Polish? Then let Polish Verb Blitz help you on your grammatical journey with over 120 commonly used Polish verbs to perfect! Featuring some of the most useful and frequently used words in the language, Polish Verb Blitz is a great way to build your core vocabulary, as well as practise your basic Polish conjugations. 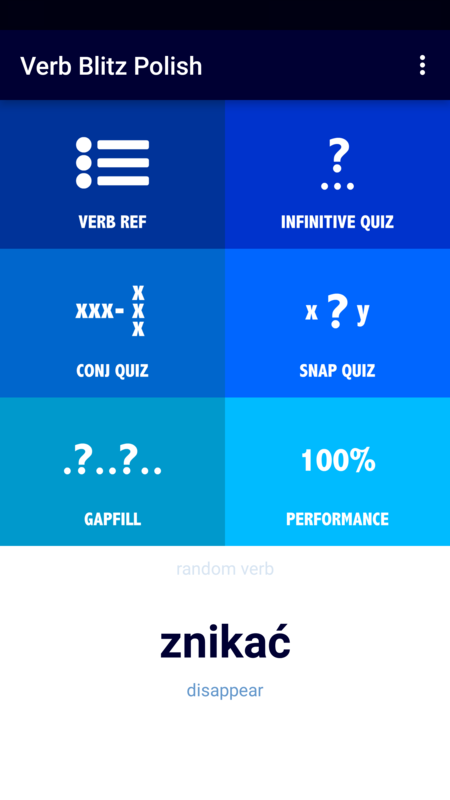 WIth a focus on the present tense, but also featuring perfective infinitive pairs where appropriate, the app has all the familiar Verb Blitz games to turn you into a verb whizz. Polish Verb Blitz is a free app for Android, supported by banner ads (on static screens but never in games) to ensure that it is available for all learners. Click here for Polish Verb Blitz on Google Play!